If you've been following my posts, you know I've been looking for a piano for Cassidy ever since we hired a teacher who plays. I happened to be talking to my mom and grandmother today and told them about this blog...they were reading it while we were talking. It just so happens that my mom has been wanting to make more room in her place, but didn't know what to do with the piano...yep, the same one I grew up with and the same one I was trying to copy for Cassidy. I can't even believe it. The problem is getting it from Albuquerque to Santa Monica, but to have that history in our school is priceless. My great-grandfather bought it new in 1921 and my grandmother played in a quartet with him as a teenager. It's been passed through the family for years...and now it's going to be at Cassidy. If you didn't know, we're naming the 4 classrooms after our grandmothers, so the Piano will obviously be going in Sally's Room. 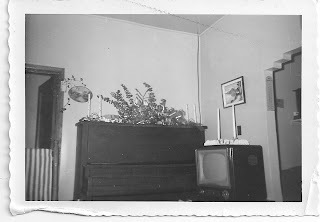 She just sent me this photo from 1956. I'm on Cloud 9.